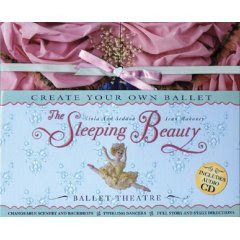 The Sleeping Beauty: Create Your Own Ballet by Viola Ann Seddon (illustrator) and Jean Mahoney (author). Copy supplied by publisher, Candlewick. Creating your own ballet for Sleeping Beauty. I was not a ballet kid. I was, however, a miniatures kid. Had a dollhouse. Had a book from the Metropolitan Museum of Art that recreated four rooms from the museum, complete with furniture. Loved it. So I eagerly opened up the box for Create Your Own Ballet, with its promises on the box: Changeable Scenery and Backdrops, Twirling Dancers, Full Story and Stage Directions, and Audio CD. The box opens as a theatre would: open the doors, open the curtains, and there is the stage. On the bottom of the box is a compartment; open it, and there are the dancers (beautiful dancers, with a stick to manipulate the dancer.) And the backdrops. Along with the book. (Follow the publisher links for images). The book is not just the stage directions to create your own play-it also includes a CD for music cues to move from scene to scene. There are additional details and information, such as the history of Tchaikovsky's ballet, information about staging the ballet with real people. A great gift for little ballerinas. Or kids who like dollhouses and miniatures. Or future directors, who will be inspired by the mini stage.